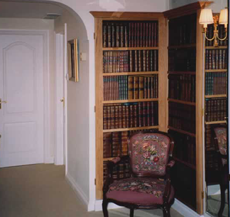 Tired of dusting those books? 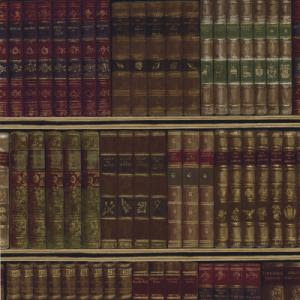 I came across this bookshelf wallpaper today while looking for wallpaper samples for a client. 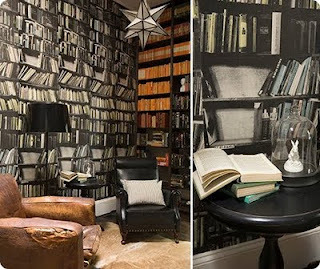 I thought it was fabulous until I looked at it closely and realized that the same stack of books had been pasted over and over again. Nah, not for me. But what I do like is that there would be NO DUST on your shelves! Sounds great right? Now this is cool! Quirky but cool! 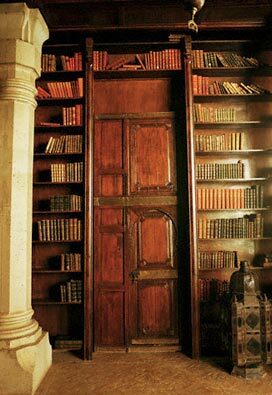 All these pictures make me wish I had a library so I could use this idea and make a "reading" corner. 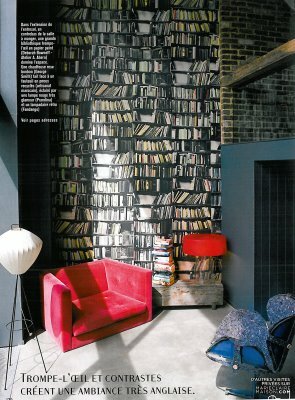 I could have a custom wallpaper made with all my favorite decorating books...wishful thinking. Too bad I couldn't just scan all those books into my brain so whenever I needed a resource it would be there! Such rich soothing warm colors. You could get really creative with this border. I know borders are OUT so I wouldn't use this design on a wall. 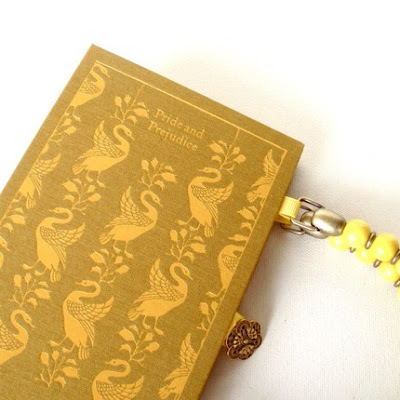 However, they could be decoupaged onto something.... How about making your own faux books? 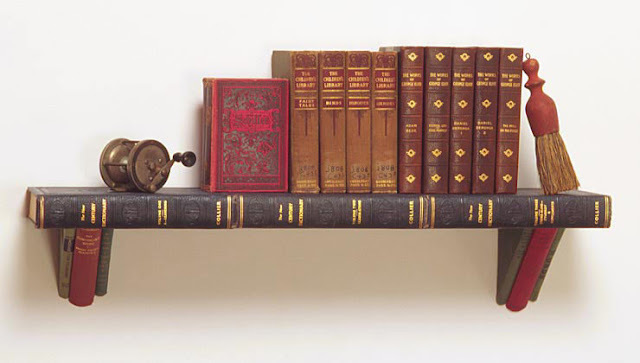 You could have wooden pieces cut the size of a book and then you could cut each individual book from this border and paste it onto the wooden book end. You could then glue a few together and have a little collection. I think that would work. 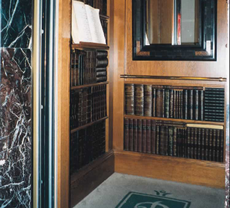 See ideas below for safes, boxes, etc. While searching for other book ideas, here are some inspiring collections that I thought I'd share with you. The owner and designer of the above room says: these photos are from the library which was once a horrible tiny bedroom which barely fit a single bed……it now has a wall filled with real books alongside a wall of Deborah Bowness wallpaper,…this room also has a couple of leather 1930s chairs, a star light handed down as a family heirloom and a cow skin hide….a cozy place to sit opposite an open fire on the opposite wall. 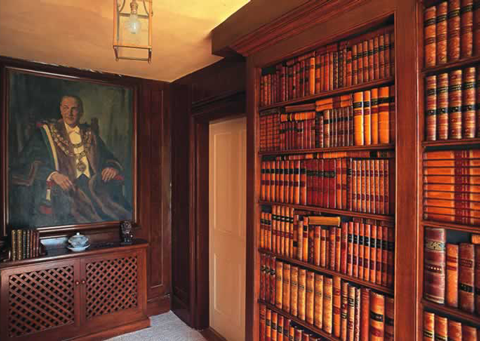 Today faux books are valued by curators, interior designers, art directors and discerning individuals for their remarkably authentic appearance. The above books are genuine antique leather books either sourced at auction, borrowed from libraries or found in private collections. Each spine is individually coloured, gilded and waxed by hand. A variety of colours are available all of which have a beautiful antique patina. Leather books are my all time favorite! 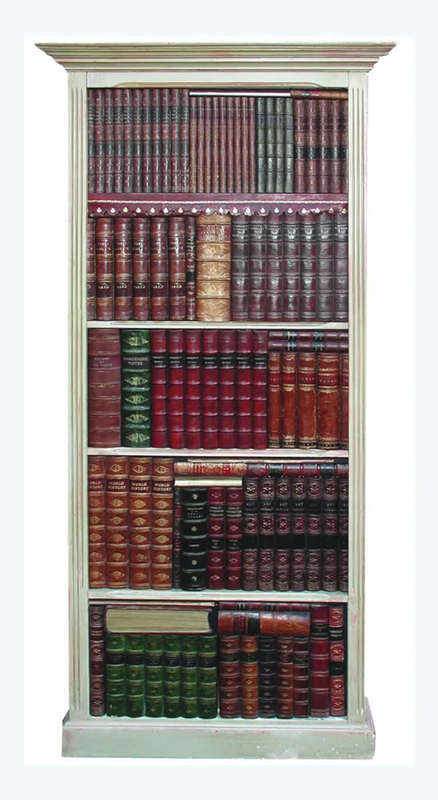 I'm not a collector of anything specific (don't usually like collections) but leather books I could collect. 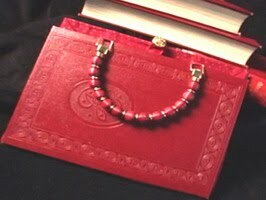 Actually when I went to Paris this past Thanksgiving, one of my purchases was a French leather bound book. 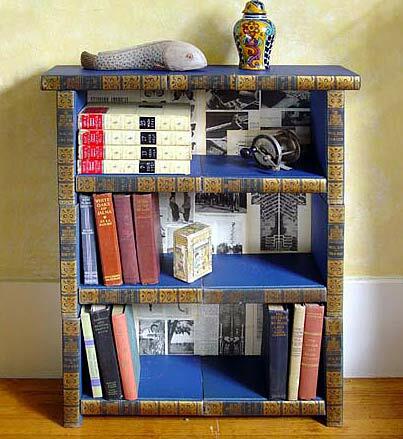 Faux books can be used to hide all kinds of treasures. 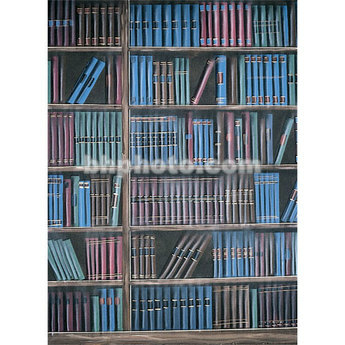 These look particularly real because they are soft cover books, don't usually see them used for a safe or hidden hideout. This is what I was talking about in my idea above. Jim Rosenau was raised in a house with 5,000 books. He has been making and selling thematic bookshelves from vintage books since 2002. 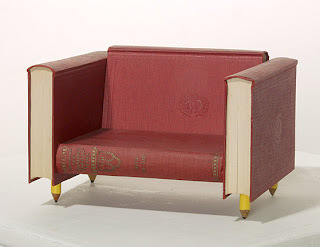 The idea occurred to him years earlier after reading an essay, "Books As Furniture," by Nicholson Baker. Given his background as the son and grandson of publishers, he assumed the reaction, should he make such a thing, would be furious. The work, once underway, proved him wrong. Fun that this one has a Spanish twist to it. 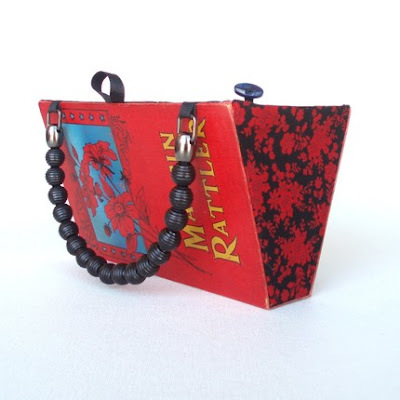 fun gift for a reader! Project by Caitlin Phillips from Washington D.C.
Go to etsy to see more designs like these. Look in your attic, I bet you have some sitting around that have some value or special family meaning to you. When you are out and about at garage sales, dig through some of the old boxes...there may be a treasure in there for you. I've found some great Hymn books at estate sales which I treasure. 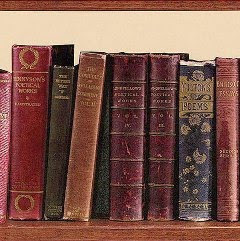 They all have that wonderful old bound look and have some wear and tear on them. I like that because it means they've had some wear and tear meaning someone has put some history into it. 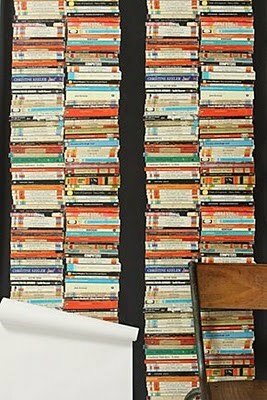 Tip of the day......Take off your book jackets when arranging your bookshelves (most of them aren't all that attractive). Underneath those jackets are some gorgeous books. You will be SHOCKED how this simple trick can make your bookshelf so much classier!